Bake My Day! : Rye-soup; a SWOT-analyses. Nederlandse uitgave "Deeg" Richard Bertinet?! Rye-soup; a SWOT-analyses. Nederlandse uitgave "Deeg" Richard Bertinet?! Ik heb de Nederlandse versie van dit boek; "Deeg" van Richard Bertinet, en daar staat in ieder geval 1 fout in. Mocht je meer informatie in het Nederlands willen, laat het me even weten? Adres staat in de kolom rechts. (SWOT acronym for Strengths, Weaknesses, Opportunities, Threats). Strategic planning translated to dough. The weakness (or threat if you like) in this case the Dutch translation in the Richard Bertinet book "Dough". I successfully made the white bread recipe several times in different shapes and flavourings. Attempted the puff dough ball, not exactly a success but that might be due to rolling the dough not thin enough. Only 2 out of 20 actually puffed. (I had better results with my pita recipe). Was underwhelmed by the whole wheat recipe. As you can see this is going to be muddy waters in every imaginable way, we're talking 116% hydration here. (Croc visions anyone?). Still, with that croc fresh in my mind I proceeded to make the dough as was stated. Didn't alter water/flour content. Just went ahead with what was written, conditioned as I am by being a Daring Baker ánd a Baking Babe, with a predictable rye soup as a result. To make matters worse I made a double batch. Cursed the book, the translation, and myself for doggedly following a recipe while I knew it was wrong. (the English original states 400 grams of flour vs my Dutch 200 gr.!). I wasn't going to trow away a bucket of rye-soup so went ahead and treated it as a kind of starter. A Threat turned into an Opportunity, we're going to have a poolish/biga derivate. Set it to ferment for 4 hours. Punched it down, sort of pulled it together with the help of a bench scraper, and again fermented it for a couple of hours. Boom, rye starters are very rewarding! Up, up and away it went, all the way to the top of the bucket! Punched it down again to a bare minimum and left it overnight in the fridge. 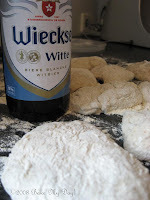 Cut the starter into pieces and roll them in some flour to separate, alternately scoop flour and starter pieces in the bowl of a stand mixer, add yeast and salt and all of the beer, holding back on a little of the flour to adjust the dough if necessary. (Depending on the wetness of the starter). Above mentioned quantities are what I effectively used. Mix to form a cohesive mass (approx. 4 minutes) and let rest for approx. 10 to 20 minutes (auto-lyse). 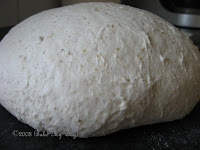 This is a sturdy dough, and the rye starter was still cold and thus uncooperative. All in all a strain on your mixer. Please check if your mixer is handling it well, the auto-lyse will make it easier on your mixer. 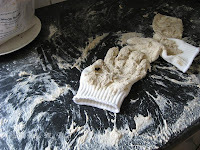 Otherwise I'd advise you to knead by hand, use the "slap your dough-method". (Although I am disappointed about the Dutch translation**, I am very enthusiastic about this kneading method!!). Mix the dough until it clears the bowl, I pulled it out before that and finished kneading by hand to get a feel for the dough. Slapping dough is a great anger-management tool! Okay, so, what we have now is a big smooth ball of dough, sticky to the touch (think post-it notes), nice strong and elastic, blistering on the skin. Cover and let ferment in a well oiled bowl for 1 hour-1.1/2 hour. Turn out on a very lightly floured surface (or a light coating of oil), push down lightly and form into a tight ball. Again, back in the bowl, cover and rise for a second time, 45 minutes. We're building Strength here! Turn out on a very lightly oiled worksurface, divide in two and shape. I made two batards and let them rise for a third and final time in a well-floured couche, covered with linen and plastic, approx. 45 minutes or until notably puffy. Transfer to a baking sheet, or on a baking stone with the use of a peel or a cutting board dusted with semolina. Bake in a preheated oven 250C for 10 minutes. Lower temperature to 200 after 10 minutes and bake for another 35-45 minutes. Et voila, success!! Which is the ultimate goal in a SWOT-analysis! Face your Weaknesses, analyse Threats, treat them as an Opportunity and turn them into a Strength! 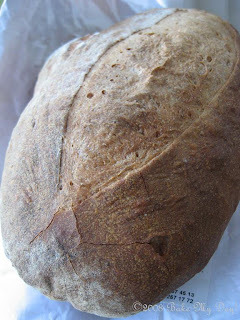 Lovely loaves of bread, a distinquished earthy flavour from the rye and beer. Great with cheese or Hungarian salami, or buttered with a sprinkling of sea salt... Yum! 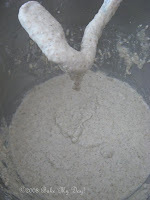 * There is a difference in using fresh or dry yeast, you use one third of the amount of fresh yeast for dried. ** I've contacted the publisher since and asked about the translation, they confirmed receiving my mail and promised to get back to me, we'll wait and see! "We strive to make a perfect cookbook, or deliver a perfect translation. Usually we succeed but in this book a couple of things went wrong. Quantities in the recipe you mentioned have been miscalculated, ("") and obviously fresh yeast isn't used in the same proportion as dried. We've purposefully stated fresh yeast only because the author prefers fresh over dried, and he tells his readers not to use dried yeast. Probably this will reduce your "misfortune". I do hope so!" Note: Translation from Dutch to English is mine, and any errors made translating are mine as well). He goes on to explain that they will correct these mistakes in the next reprint and pay special attention to quantities. Now... where does that leave me? Besides the fact that the original English copy does state fresh ánd dried yeast indeed (dûh!) I can't help feeling that this is the easy way out; so sorry you bought a book with mistakes and paid 26 euros for it...too bad, but thanks anyway? I'm happy that they took my remark seriously and that any errors will be corrected. Future buyers of this book can be satisfied. But....my copy? Is this recipe the only one that is faulted? I'm not willing to try out all recipes anymore. Am I right in feeling a bit left out in the rain? Or just badgering.... What's next? What would you do? I think I'd like to return my book and get my money back or an English copy of same book. Return the book and try to get an English copy instead or otherwise your money back. My evaluation of your bread is: you are a genius; totally love the way you came out of a potential disaster. The publisher: at a minimum should have addressed correcting all errors they are aware of and made special effort to notify you in the future of any they find-email would work or have corrections noted on a web page for you to check. Except that I like the slapping method and found the recipes interesting, I'd return the book. But any you have a question about I'd be happy to help by scanning the english. Pain in the . . . Brilliant save of the rye soup. I don't have Dough but I do have another book, fairly recently published, that is rife with formula errors and it is frustrating. 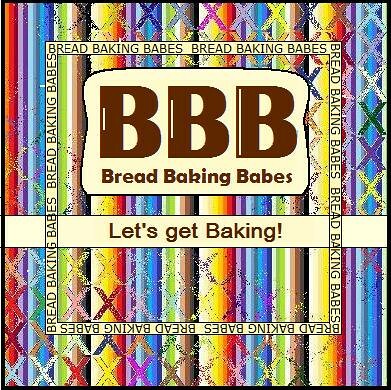 Now when I make things from it (because it does have some great breads) I look at it as a challenge to see if I can outwit the formula and come up with something good. Wonderful save - I'm glad that you just winged it anyway! As to the book - I think that if there're good ideas in there, then it's still valuable, unless you can return it. I'd return it, personally, and point out to the bookstore why you're returning it - they can put pressure on the publisher to come out with a statement or something to insert into the books which are already published, so that nobody else runs into this! You made a fabulous bread out of the soup. Looks great. I think what Joanna says makes great sense, bet you would get a better respons from Bertinet. If I wrote a book that got badly translated, I'd be happy if somebody pointed it out to me. The respons from the publisher is way too easy in my view. Can you still return the book? (heb je het bonnetje nog?) Anders moeten we maar even aan de skype hangen en alle hoeveelheden doornemen ;-))), zodat je er toch wat mee kan! I think go with Joanna's suggestion of contacting him through his website. It doesn't exactly look good for him and what a cop out from the publishers. They should have offered to send you an English copy free of charge. Love that you did a SWOT analysis on this and saved the day. You're my HERO of the week! Als je niks gezegd had...hadden we nooit een blooper vermoed ! Enne..als je bij Bertinet op de koffie gaat..ikke mee , hè ?! Yeah, it is hard to go from fresh yeast to dried, but fresh yeast is so hard to find. 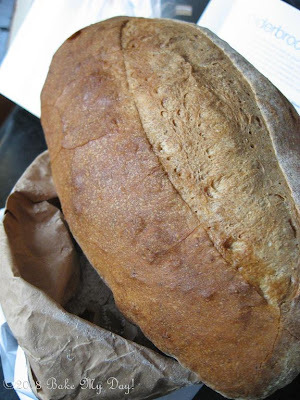 Love your swot analysis and I admire your brilliance in saving the bread whic is absolutely gorgeous , by the way! You are amazing! I would have cried and thrown the rye soup away. Your rescue bread is beautiful. I would have thrown over the rye soup and drunk the beer for the next round! But, you're a much better person than I am. You're amazing! :):) And so is the bread! na zo'n enthousiast bericht moest ik het ook maar eens proberen. Nu, na 8 dagen, gaat het nog steeds goed en, eindelijk, kan ik morgen klondike pancakes gaan bakken. So far so good. I am having the same issue with a pastry cookbook. 30 euros and full of mistakes, answer from the publisher "glad you were able to fix them at home though" :)..that's because it's my job you moron! not eveybody dives head first in a pool of caramel!! All the hard work you did with the bread worked, it looks wonderful!